Now that the dust from the 2010 Elections has cleared, it is time to start looking at how the 112th Congress will compare to the 111th. 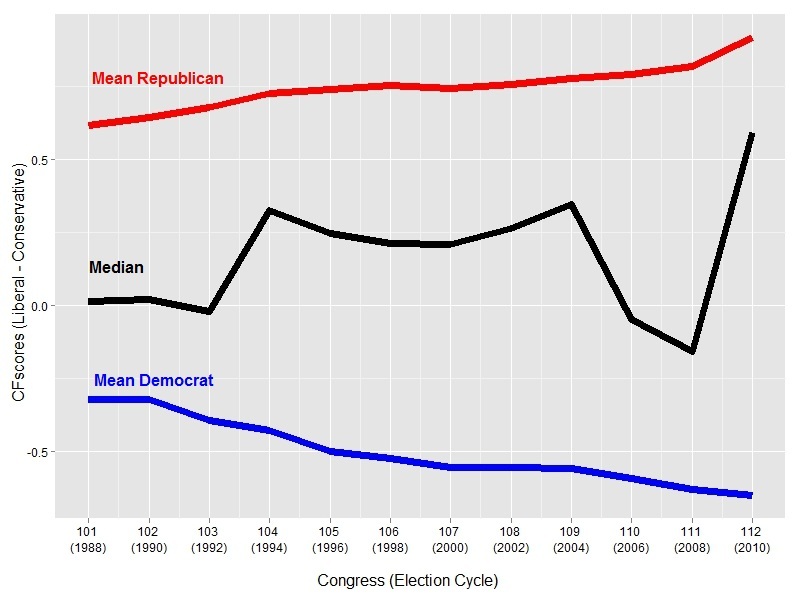 The figure below tracks the ideological positions of the median House member, the mean Democrat, and the mean Republican since 1988. The replacement effect of the 2010 Midterm Elections is unlike anything in recent memory. The shift in the House median is two and a half times what was observed after the 1994 Election, wiping out the effect of Democratic gains in the previous two elections and then some. 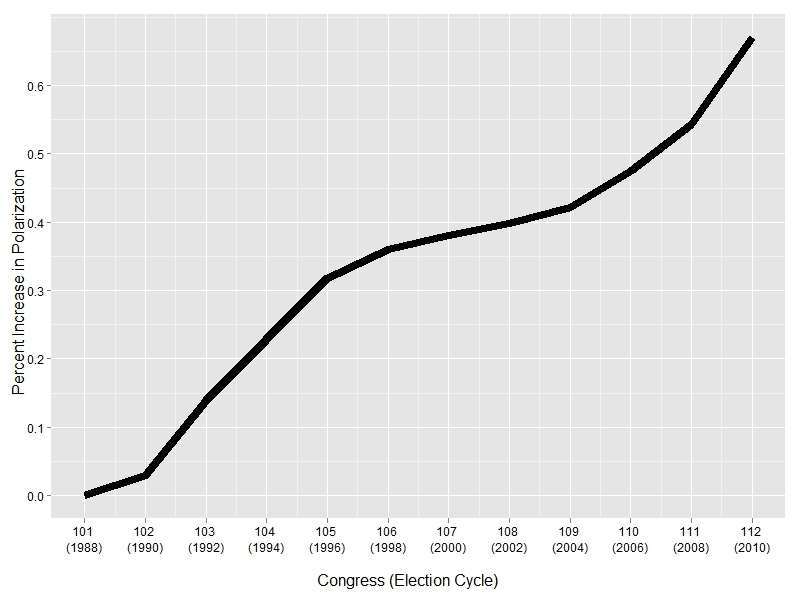 The 111th was the most liberal Congress in the past three decades; the 112th will be the most conservative. 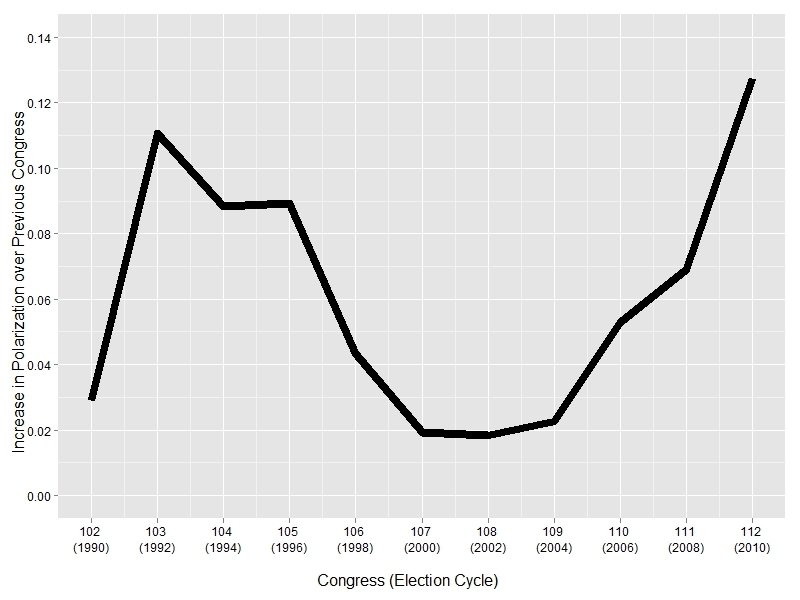 The 2010 Elections had a profound effect on congressional polarization. Not only will the 112th House be the most polarized on record; 2010 will surpass 1994 as the most polarizing election cycle. The figure below helps place the historic jump in polarization in perspective. It displays the ideological distributions of House members continuing on from the 111th Congress, alongside the distributions of the entering class of Republicans and the sitting Democrats they defeated. Two features stand out. 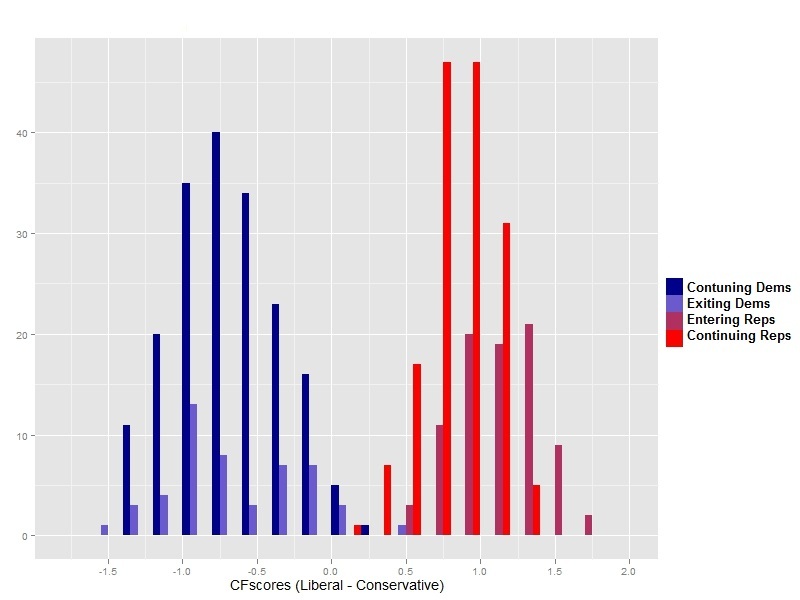 The first is that the mean entering Republican (1.09) is substantially more conservative than the mean continuing Republican (0.82). In total, 77 percent of freshmen Republicans in the 112th Congress will locate to the right of the party median from the 111th. In other words, nearly 8 in 10 incoming House Republicans would have been on the right wing of the party in the 111th Congress. The second standout feature is that, contrary to many media accounts, the Republican wave was an equal opportunity un-employer for Democrats. Democrats who lost their reelection bids were slightly more moderate than those who retained their seats—0.61 compared to 0.64—but the difference is statistically insignificant. The attrition rate was greater among centrist Democrats, but there were so few Democrats remaining in the political center that the losses had to come from elsewhere. The polarization resulting from the 2010 Midterms is fundamentally different and more worrisome than what had preceded it. By historical standards, the post-war era stands out as a period of relatively low partisan polarization. This is largely attributable to the coalition between Northern and Southern Democrats. The increase in polarization during the 103rd through 105th Congress corresponds to the tail end of the Southern partisan realignment, a period during which southern districts that had traditionally elected moderate Democrats (a.k.a. Dixiecrats) began electing conservative Republicans. As the Southern Democrats gradually disappeared throughout the 1980s and 1990s, the parties became more clearly defined, thus returning congressional polarization to the historical norm. The hollowing out of the political center explained the momentous rise in polarization during the Southern realignment. Now that only a handful of moderates remain in the House, polarization can no longer be portrayed as a story of vanishing moderates. It appears the rise of the extremists has stepped up as the driving force behind congressional polarization.